Writing for MacStories was a perfect side-gig for me at the time, as it gave me a welcome distraction from my full-time study at university. At MacStories I got to immerse myself in the world of Apple and technology, practice and improve my writing skills, and importantly for a student, earn some extra money. A highlight of my time at MacStories has got to be the amazing group of people I got to work with over the years. There are too many to mention, but they were all delightful and it truly was a global team – headquartered initially from Federico’s small Italian town of Viterbo and then in later years, Rome. I spent many, many hours in the internal MacStories chatrooms over the years. We discussed everything from who would handle covering the latest bit of news that had just broke, theorising about what might be in the new iOS and macOS software releases, hundreds of jokes about Australia (at my expense, the sole Australian on the team), and of course, sharing many videos and GIFs of MacStories' favourite Australian, Karl Stefanovic. Speaking of the MacStories chatroom, the venue of that chatroom is in itself an interesting piece of technology history over the past decade. To the best of my recollection, these are all the different pieces of technology and software that the MacStories team has used over the years for our internal chatroom. When I first started, it was an IRC channel, then it was hosted on Campfire (now Basecamp). Once iMessage launched we gave that a solid go, but became insanely frustrated by the group chat getting split into multiple threads and moved over to Microsoft's GroupMe, before we eventually moved to, of course, Slack. 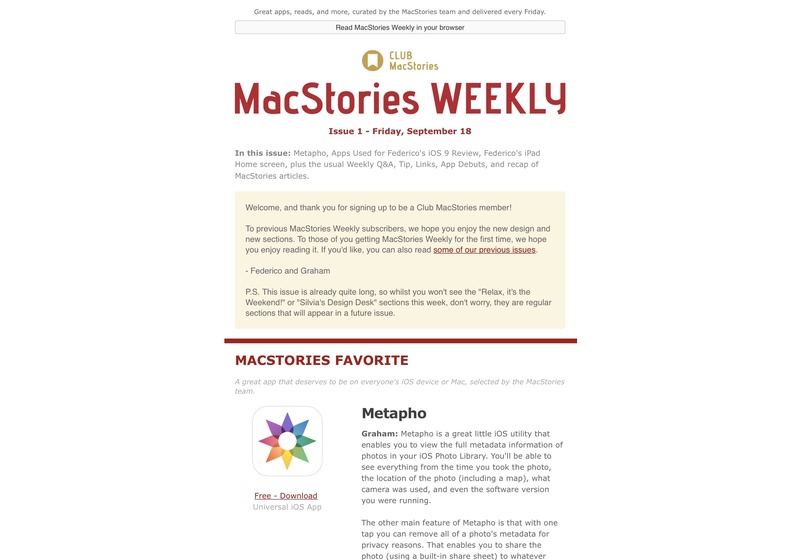 Probably one of my proudest and most rewarding moments at MacStories was working with Federico to develop the early iterations of the MacStories Weekly email newsletter. As you can see above, I still have some screenshots of our early chats and publishing the very first issue in August 2014. 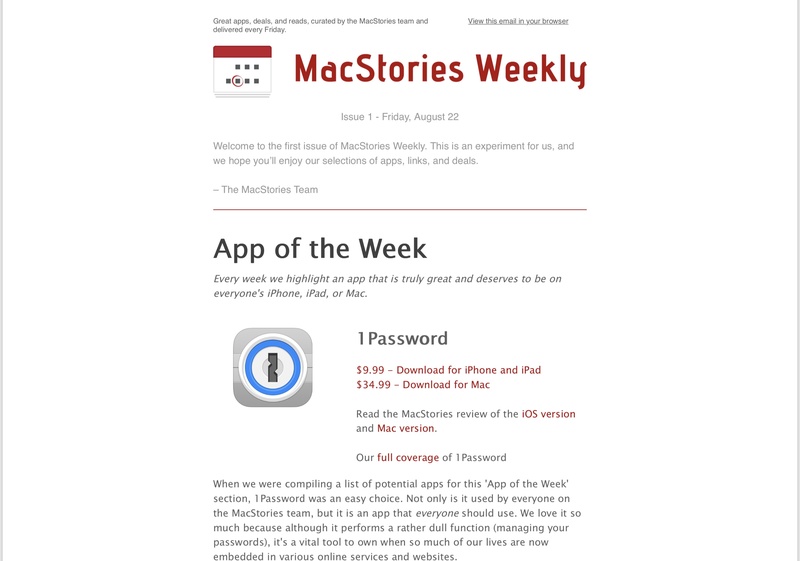 It was a quick turnaround too – Federico and I effectively designed, figured out the logistics, and put together the first issue of MacStories Weekly in just two weeks! It was a lot of fun, and very rewarding, to turn an idea into reality so quickly – especially as we grew in subscriber numbers from hundreds and then thousands. We then had the opportunity to refresh MacStories Weekly in September 2015, when MacStories Weekly became the key component of the brand new Club MacStories membership. 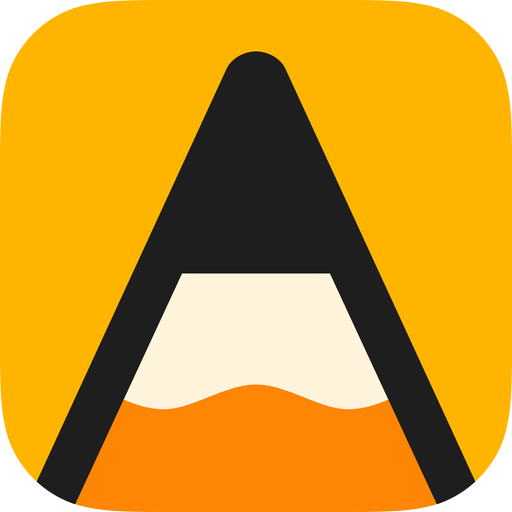 A big focus of the MacStories Weekly refresh was on improving the quality and quantity of the newsletter's content so that it was something our readers would happily subscribe to as part of Club MacStories. That meant a fresh design, and coming up with additional sections and content to include each week. We also introduced the additional Monthly Log email newsletter to deliver even more content to the new Club MacStories members. It took a lot of work to wrangle Mailchimp's editor to create the design we were looking for, but we got there in the end and it was well worth the effort. I think it is safe to say the refreshed MacStories Weekly and new Monthly Log were a hit, and Club MacStories had a great launch. It laid the foundation for what Club MacStories is today. Thank you to all the readers who supported MacStories, Federico, myself, and the rest of the team over the years. Without your loyalty and support, I would not be able to be here today reminiscing about my five years at MacStories. Congratulations, Federico! You have built MacStories into a widely respected publication and created a job for yourself that you clearly enjoy and are passionate about. Thanks for having me along for a few years of the MacStories journey, it was an absolute blast. I look forward to the next ten years of MacStories!